Published Feb. 27, 2018 at 2:01 p.m.
On the occasion of the American Association of Independent Professional Baseball's formal welcome, Mike Zimmerman, Chief Executive Officer of ROC Ventures and its new development, Ballpark Commons, invited the team's future fans to give it a name in time for the 2019 launch. "We're offering a $2,500 prize to the person who contributes the name we use," Zimmerman said. "There's no better way to make this team a part of the community than to have the people in the stands help to define its image and style." Fans are invited to go to baseballwi.com to enter their choice for a team name, as well as mascot suggestions. Deadline for entries is Tuesday, April 24. "The stadium at Ballpark Commons is being designed as a tribute to Wisconsin agriculture and farming families," noted Zimmerman, "so we'll be looking for those types of themes. But don't be afraid to be creative – a little 'outside the box' thinking is always appreciated." The Ballpark Commons stadium is scheduled to break ground this Spring 2018. However, advance ticket deposits for the inaugural 2019 season are being accepted starting today at baseballwi.com. A $100 deposit towards a ticket package for the 2019 season gets early-birds a limited edition team hat and first pick of seats in the new stadium, which promises food, fun, and entertainment for the whole family. 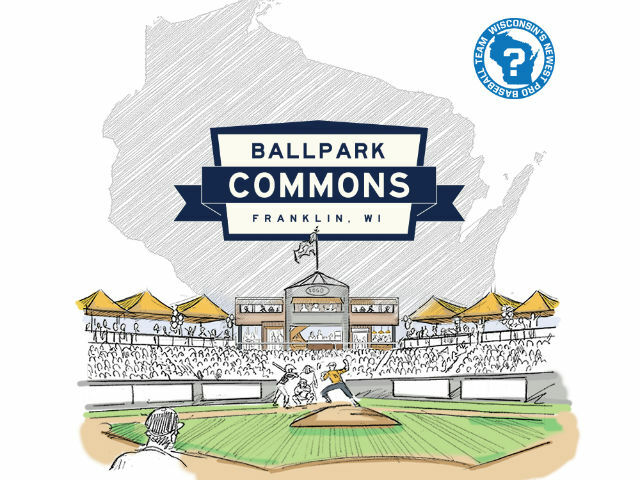 Ballpark Commons, a mixed-use development featuring a 4,000-seat stadium, commercial and retail businesses, restaurants, residential apartments, and various entertainment and active lifestyle features, will be located in Franklin, WI and is expected to begin construction in 2018. About ROC Ventures: ROC Ventures manages a collection of brands in the sports, entertainment, and real estate sectors. These include the Milwaukee Wave, The Rock Sports Complex, three Summer College Baseball Franchises located in IN and NY, and the Ballpark Commons development. ROC stands for "Return on Community," a goal which informs each and every endeavor undertaken by the organization.